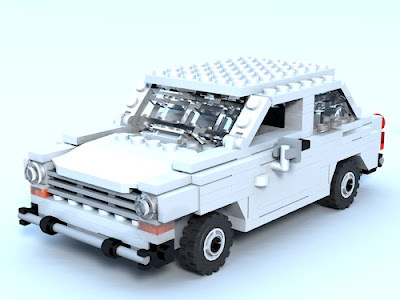 I am a big fan of small LEGO cars, especially the creations of Mad Physicst. For a long time I have planned to build cars that were prominent during my childhood. Of course in 1/22 scale. Not surprisingly, these cars are from the Eastern Block: Trabant, Wartburg, "Small Polski", Škoda and the others. This is the first part of the series, a Trabant 601 from the 80s. I have rendered this on a computer for a start, I hope you like it. I plan to build it from real bricks as well. The road was slow and is to become even slower. First I got the scale wrong. 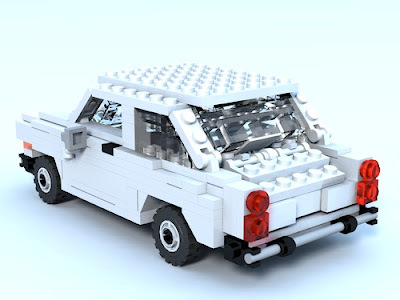 The real Trabant 601 is 1504 mm wide, it is almost exactly 8 and a half bricks (1504/22/8 = 8.54). The first version I have built in LDD was 8 bricks wide but I have realized that it is too small and the proportions are wrong. To build it one brick wider - well, I could start from scratch. Then I have put it into BrickSmith, I have converted it with L3P so that I can render the image in MegaPOV. And I have spent quite some time playing with the rendering settings, mostly based on Koyan's tutorial. Well, this is the result, I hope you like it. The next one will most likely be a Škoda 120 because one of my friends is a big fan, or maybe a Small Polski. A few more images in the album.